On April 21st, 2008 the Santa Monica Big Blue Bus celebrated its 80th year of operation with a fleet of more than 200 vehicles powered by alternative fuels, transporting more than 80,000 daily riders throughout a 52-square-mile service area. In order to celebrate this great achievement, The City of Santa Monica held a free public celebration event to honor the Big Blue Bus' 80 years of service to the community on April 14th on the Third Street Promenade at their store in Broadway, downtown Santa Monica. For this public celebration, The City of Santa Monica selected a group of three students from The Art Institute of California-Los Angeles, in which I was enrolled in a Graphic Design Program, and became one of the three selected students, to create an exhibition for this event. 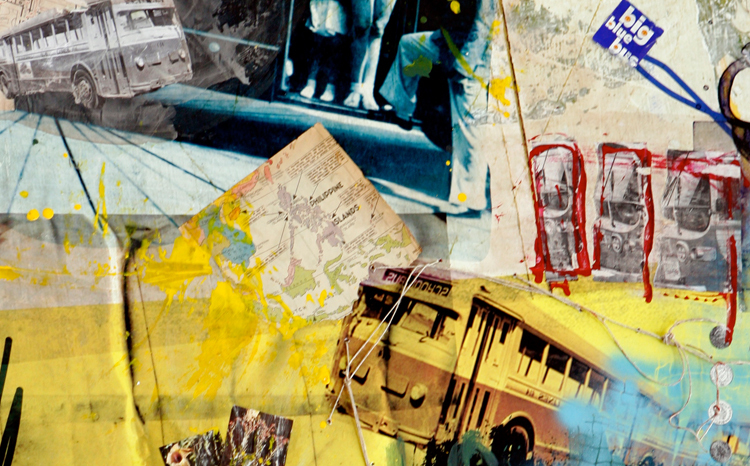 The challenge given was to create a cohesive exhibition with art work that would celebrate the Big Blue Bus anniversary, as well as to bring environmental awareness to the people from the city. We were given strict guidelines in regards to the materials we could use for production of all art and products. Every single one had to be made with environmentally friendly materials. 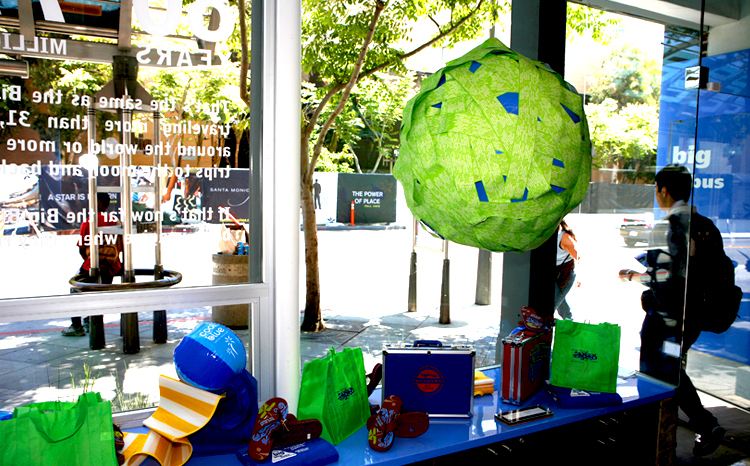 The work for the exhibition included the following: Window display design, creating artwork to be exhibited within the interior of the store, design and production of promotional products and creation of marketing material. Working closely with the city's director and transit agency team, we studied The Big Blue Bus history and worked on developing a strong concept in order to convey visually it's relevance and achievement. The concept was Ride Blue Go Green, highlighting the fact that when one rides the Big Blue Bus, he/she is doing a sustainable action that contributes to making Santa Monica City cleaner and more green. Facts about how the Big Blue Bus contributes to this were included within the artwork around the store in order to inspire sustainable behaviors as such. Being The Big Blue Bus 80 years Celebration exhibition a collaborative effort, our roles were completely interchangeable and each and every single one of us was involved in almost every aspect of it. But one particular aspect of the exhibition that I was completely in charge of was the creation of three art pieces to be hang on the walls along with a window display piece, which consisted of a sculptural periodic table. For the three art pieces, I implemented a collage technique, using a variety of recycled materials and paints in order to make these handmade, vibrant, collage/paintings on wood blocks. My objective was to use visually compelling imagery in order to narrate abstractly the history of The Big Blue Bus. I used the concept of a periodic table as a medium to inform the public about all recyclable objects and specify where within the City people can recycle them. The combination of letters showcased on the front of each rectangle represent each object and on the back of each, the information about the centers in which these objects can be recycled is written.